so what is the hold up?? we can't decide on a color. + our two favorites are complete opposites! but then we saw another dark color that we fell in love with. both have white cabinets, as do we. & we love them both. I am absolutely in love with the YHL kitchen, but the darker color is really eye catching. I say take a risk and go with the darker color! Dark, dark, dark! It's amazing how it contrasts with the white. I would LOVE to have that dark kitchen!! It is gorgeous!! I'm currently struggling with the same issue! 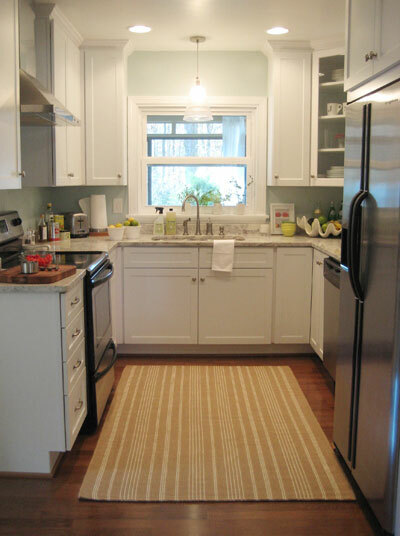 Painting a kitchen is such a PIA that I don't want to make a mistake and have to re-do! I really like that dark kitchen! I think to pull it off, you need more than just white cabinets though. Light countertops, stainless steel/brushed nickel, white accessories...basically, everything light and white but the walls. I have an all white kitchen- like everything is white, even the oven and the appliances. it just feels brighter and cleaner! Try dark! It looks stunning. Good luck!! I love the YHL kitchen, but the dark kitchen is amazing! Go for a dark color, with a light fixture that fills the room with light. White cabinets. Good luck! Love that dark one. LOVE it. I love them both as well, but go for the dark!